RainBerry in Mag Pi Magazine Issue 79!!! Prusa i3 MK3 3D Printer ! Motivated by the video, Militarizing Your Backyard with Python, I was tinkering with Raspberry Pi for Squirrel recognition to protect my garden bustling with sweet peas and tomatoes. As a step towards the goal, I started first programming Raspberry Pi A+ with OpenCV and then emailing me the face of any person intruding in my backyard. However I found no suitable Pi case in the market which is compact, weatherproof and has elegant look. Fake security camera case sold on Amazon was quite cheap but broke easily. 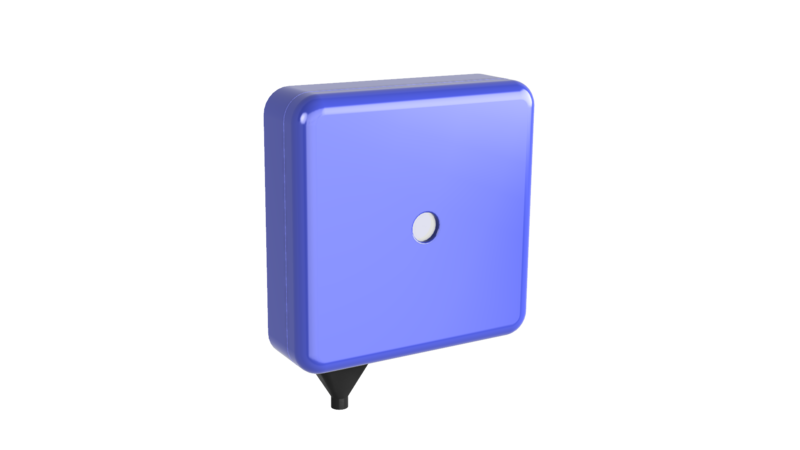 It made me to think towards designing a compact case which can be used outside to monitor the backyard garden and get alerts. I sat down and sketched the general shape of case on back of a scratch paper. Here is how my sketch looked. I chose to stick with Square shape, though Pi A+ is a rectangular shape. With no experience in designing plastic parts meant watching tutorials from YouTube and learning from the iterations. It took one month for me to become familiar with tools. 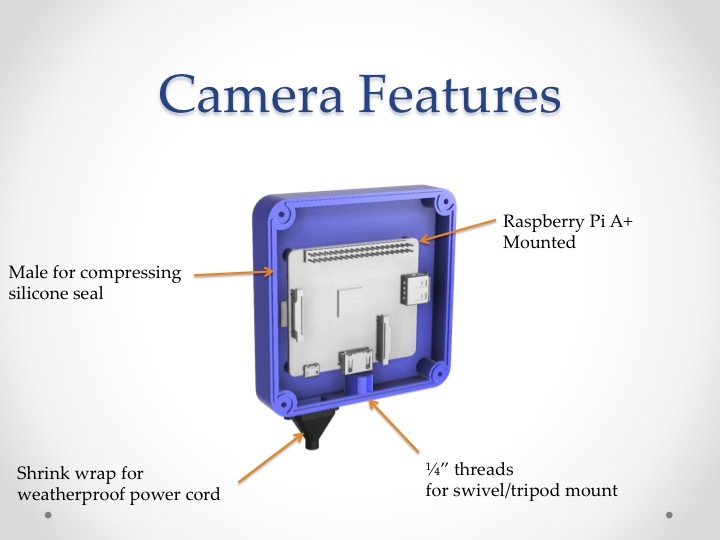 I broke down the design work several intermediate goals, beginning with obtaining the dimensions of Pi A+, Pi Camera, WiFi adapter and micro USB power cord. Vernier with LCD display manufactured by General Tools was very handy for this work. 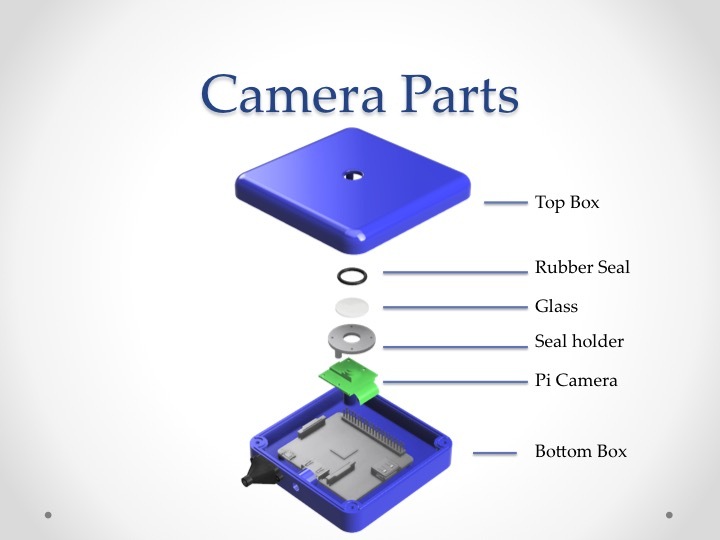 Ubiquitously available CAD models of Pi and Pi camera also helped to verify the clearances in the design by importing them and assembling with the designed case. Many thanks to the effort by several community members of GrabCAD. Next step was to size and fit all the parts in the given space. Mounting Pi A+ with SD card and WiFi adapter in the case was easy. Mounting the Pi camera above Pi in as small as possible was a little difficult. I chose to mount camera directly on the top case since the data cable of Pi is flexible. Weatherproofing method of cellphone or electronic case is pretty standard and based on using a weatherproof seal around the case. It was not difficult to split the case into two parts and then add the groove for holding the seal. Similarly seal of the glass is hold together by the seal holder attached to the case. It compresses the seal and hold it in the place. Designing of screw bosses was a totally new area for me. I could not find any reliable information source and resorted to plastic part design guidelines from several plastic manufactures and handbooks. I am providing the details of the one from the book, Injection Mold Design Engineering by Davide Kazmer. Suggested size of d was 88% of D.
I used FDM method for 3D printing in ABS plastic due to limitations of escape holes of SLS printing. This is how the camera looks after final design, 3D printing and assembly. I tested camera in rain for more than 2 hours and no water entered in it. Here is the picture of it in rain. After the test in thunderstorm, I opened the camera to see no water in case. You can view the 3D model and 3D print it from Pinshape. If you do not have the 3D printer then try finding a 3D printer on makexyz.com in your area and use it to print. Models also available for new versions of Pi3 as described in this recent post and can be downloaded from Pinshape links, Pi 3 and ZeroW. Glass piece 18mmx 1.5mm from Aliexpress.com, since 17.9 mm is not available. Here is the timelapse video recorded with this camera. 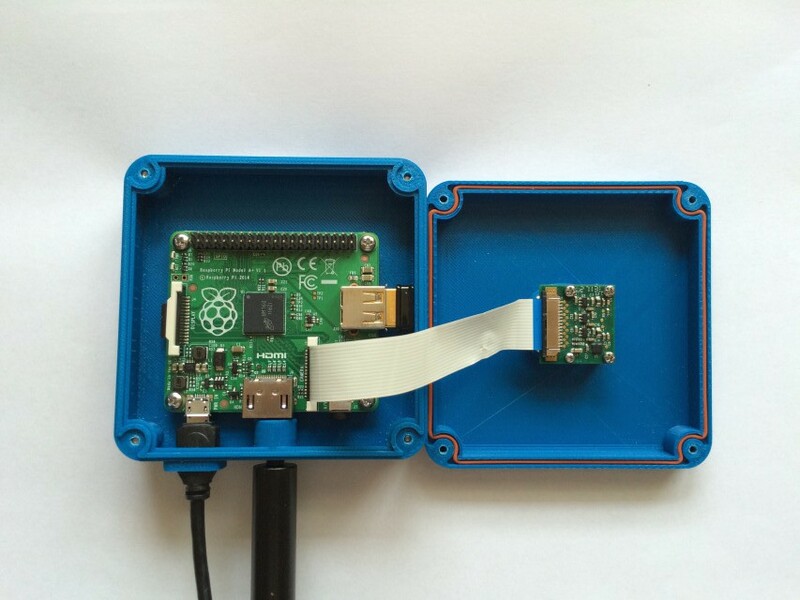 This is a really nice “hack” for pi. Can you tell me if you keep it 24/7 open, also, what is the cpu load with the camera ? From experience with identical boxes for amateur radio connections, what will be needed is a breathing hole at the lowest point of the box. Those boxes are not 100% rainproof under extreme conditions (coast, hills, etc). So the breathing hole that allows condensation out will also occasionally act to prevent rain buildup in the box. Did you ever consider getting an off the shelf IP67 rated solution for your power cable? for instance, look up ‘Cable Glands’ or ‘Clamping Glands’. Once installed you can basically tighten them around the cable by unscrewing it. You can then apply some silicone to it just to be sure. It would give it that nice industrial look too. 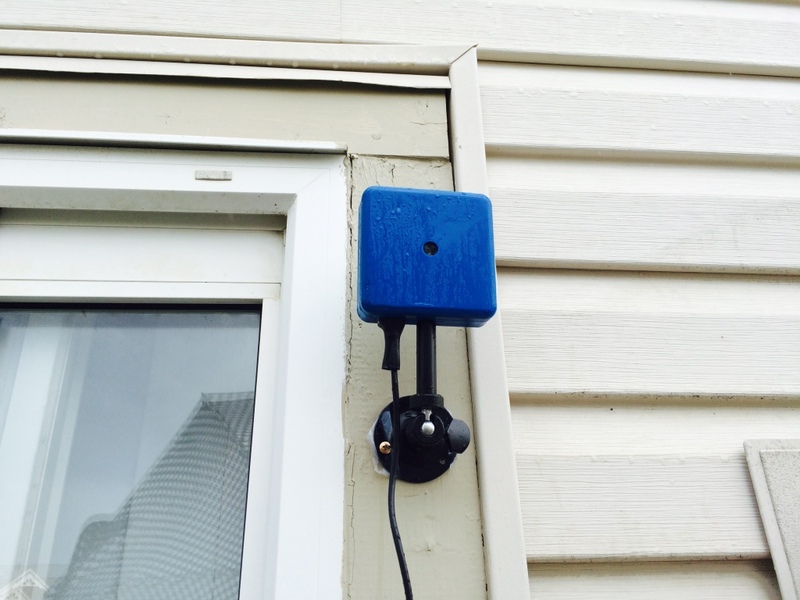 We use these (the plastic ones) on junction boxes for outdoor electrical installations all the time. Thank you for the feedback. I did not search for cable glands and looking them up now on McMaster. I will get familiar with them and use it in next version. I searched for waterproof usb cables, but could not find suitable one. Very cool article, would it be possible to download from somewhere the STL files? I’m just learning to design things and this would help somehow. Can you post the STL on Pinshape so it can be downloaded and printed? I have a 3d printer already, but it’s not supported via the Streaming method. Pinshape can better provide support on streaming to your 3D printer. Please contact Pinshape on https://forums.pinshape.com/. Very nice case! Are you planning on selling those? I don’t have 3D printer, so I wanted to use makexyz.com service but the only option they have is to upload STL files, not stream them from pinshare. Is there any way to get STL files from you? Thank you for the feedback. You can contact your local 3D printer before ordering, through mailing system on makexyz.com. They are mostly makers and work freely with streams from Pinshape. We are working on next version based on feedback and plan to sell them. How do you mail them,? I’d like to buy one of these. Do you have any idea of when you will be ready to sell the next version? What’s the point in blogging about this when your not going to share the STL’s for the other makers out there? If you don’t want to share the STL’s then offer them up for sale here on your blog! Wow ! What a great project. Can you please make your STL fils to be downloadebel on Pinshape ? 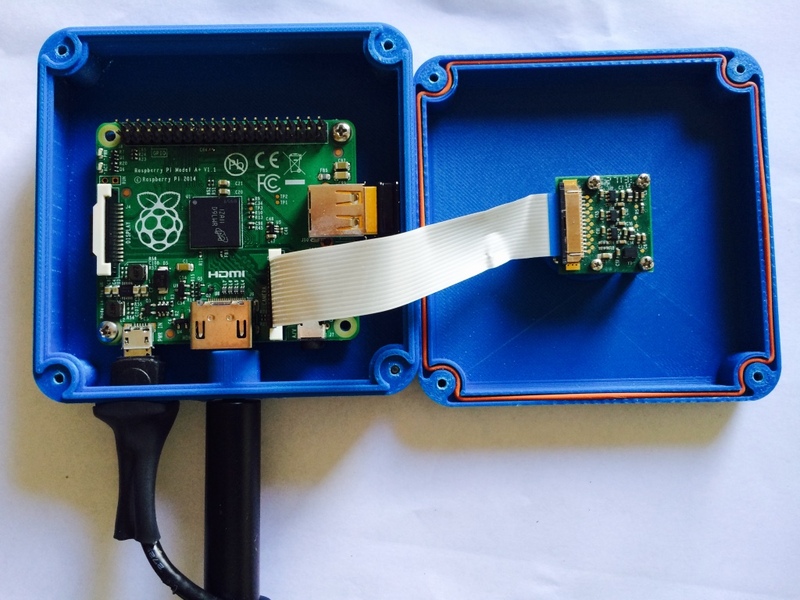 Is there an updated version available that would fit the rpi2? I love this design, but am fairly certain that rpi2 won’t fit. thanks! Hmm.., I will have to get the cad model of Pi2 and generate it. I can not assure you, but will try. Do you have any issues with overheating during extended use? No I did not face it. There were also no restarts indicating overheating. Nice looking waterproof case but tinydeal.com is stating no item under your code number for the glass. Try this one from dx.com which has same dimensions. pinshape is throwing an error saying “Sorry, purchasing no longer available”.. Is it possible to get this uploaded somewhere else that actually works? Sorry for this problem. Pinshape was very good platform which was shutdown by their investors today. I moved the models today to another website 3dexport.com. Please try link below or let me know. Oh that’s a shame they shut it down. Thanks for the quick reply and re-up! Would you be interested in working on a new version for the recently released version of the Raspberry Pi? I could easily modify this to fit to next version. However people are reporting thermal issues under certain conditions for new version. I could still release it, if there is large interest. So far only couple of people asked for it. I’d definitely be interested. Hmm yeah thermal issues could be interesting to solve given it’s weatherproof purpose. It’s a stl file, not a CAD file to see all history. What CAD package are you using. I would be interested in one that suited the Raspberry Pi 2 B.
I will let you know when I build one. Hmm, I tried to reply earlier but it failed. I am using Autodesk Inventor. You could easily migrate to Fusion which is based off inventor. Sure, I can definitely try that. Would you be able to send me an email so we can organise purchasing the CAD model from you? It is possible but requires complete redesign. Thank you. Damn i thought you would try to shrink the case ;-D Maybe in the next Months for a redesign? Is the ABS plastic ok for using it outside with snow and like -20°? Great project you have. I have purchased your files and have tried the Raspberry A model. Write me an email if you are interested in designing a box for Raspberry Pi 3 Model B. I could provide funding for. This has to be an immediate project thou. The IP would still be yours (or public). Thank you. I will be writing to you. Hi … I would also love a version of your case for the Pi 3. Any idea when that may be available? I am looking for a CAD model of Pi 3 to start of with. I could then modify original easily. I finally created new Pi3 based cases. Please check them and let me know your feedback. Could you make a case for the Pi3 that also uses the infrared modules? I would like to use this to see people at night. I tested one infrared module, Bright Pi. I did not continue to create space for including it further due to some reasons (complexity to assemble, brightness, heat etc.). Which infrared module you plan to use? Many users feel that A+ is better with camera due to low power consumption. I purchased the stl file of this case from 3DExport and printed it. It’s really great work and it perfectly fits my needs. There seems to be something missing in the part holding the camera (Top-box-mb.stl), though. The photos above show four screws holding the camera in position but in the stl-file there are only two mounting posts. Is that on purpose for some reason or should there be two more? First install rubber seal of glass, then glass, then seal-mb part into top box with four screws. As seen in this picture. Camera is indeed mounted with four screws. Two screw hubs are on seal and other two hubs are in top box. I hope that is clear or let me know. Any movement on a rasPi3 version? Please check the new Pi 3 version. I am sorry for the late reply and update. Hi, Did you end up creating a new case for the Pi 3? I’m really interested for a project of mine! I finally got some free time to finish Pi 3 case. Please check it. Apologies for the delay. I just released a new design for Zero. Please check it. Also interested in the Pi 3 case. Heat would be a concern given my applications CPU usage. Not sure how that would be handled. Would also need a spot for a USB-based cellular module. I will be able to spend some time this spring. Again heat is main concern and I may need to test it. I was waiting for some fix from community or raspberrypi.org for it before making new case. Please check the new Pi 3 case and let me know your feedback. Love the case, can you make a specific case for a dog tracker I am working on? Most of the Chinese junk is not water resistant, I am interested in a design that can be opened and closed to access the micro-USB for recharging. Let me know if you are interested. hi i was just wondering, can the design be changed to fit other sizes of raspberry pi? I am need of this but i have a raspberry pi 3. I just released a new version for Pi 3 and also zero. Please check it. Would you be willing to modify your Zero Pi enclosure? I am wanting to use a cellular USB modem and it doesn’t look like I will have enough room. I’m willing to pay. Can you please share the link to modem? How well has this held up to UV exposure over the years? I’d be tempted angle the bottom of the case towards a small hole in the bottom of the back (away form the cable exit), just in case any water does ingress. New design with O-ring in the bottom seal work well.